Glenn Manning, "The Amazing Colosasal Man," believed dead after falling from the Hoover Dam, reemerges in rural Mexico, brain damaged, disfigured, and very hungry. A giant lizard terrorizes a rural Texas community and a a heroic teenager attempts to destroy the creature. A mysterious hypnotist reverts his beautiful assistant back into the form of a prehistoric sea monster that she was in a past life. Dr. Paul Linstrom: Now, the reason for this is rather technical, Carol, but to give you a simplified layman's explanation, it might be explained that, since the heart is made up of a *single* cell for all practical purposes, instead of millions of cells like the rest of the organs of the body, it's reacting in an entirely different manner to this unknown stimulus or forces behind this whole thing. Lt. Glenn Manning (Glenn Langan) is one of many people at a test site for a plutonium bomb when things take a bad turn. A plane crashes near the bomb so Manning runs to try and save the pilot but the bomb ends up going off. He's left with third degree burns but the doctors are shocked when the next day his skin is like brand new. Soon they begin to realize that he's growing at a rapid pace and it's having an effect on his mind. THE AMAZING COLOSSAL MAN is one colossal bore. It's easy to see why this film has gained such a huge following but I honestly believe it's due to the posters and promotional stills more than the film itself. Director Bert I. Gordon made a career out of doing these "growth" pictures so there's no question that he was qualified for the material but you have to wonder what the screenwriters were thinking because the film just doesn't have much in it. Well, to be honest, the screenwriters were probably limited due to the tight budget so this is perhaps why the majority of the film has the colossal man sitting in a bed or under a tent. These scenes just drag out the running time and in the end they're just downright boring. Also boring is the relationship with the fiancé because she basically just stands around asking if there's anything she can do. The film finally picks up some steam during its final act when the giant breaks free in Las Vegas but by the time this happens it's just too late. The performances are pretty much what you'd expect from a movie like this. The special effects are all pretty lame and it's obvious how they were done. Even for the standards of the era these effects really aren't all that special. 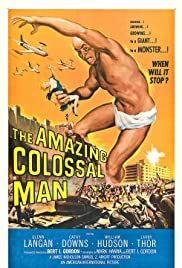 THE AMAZING COLOSSAL MAN is slightly entertaining if you like this genre but there's no question that there's not too much here.